111. Direct Collection. By this term we indicate collecting transfer forms received in the usual way, riding on the cars of the system in question, paying fare, and asking for a transfer. However, in order that the transfer may be retained by the collector it must not be used. This is, of course, the most obvious way of getting transfers for a collection, but even this must be done carefully. On some systems it is possible to ask for a transfer and get it without further explanation; but usually the passenger asking for a transfer must state his desired destination, and that requires in itself some knowledge of the system. So the collector should get some idea of the topography of the system, and ask for a transfer on the assumption that the universal transfer privilege prevails. This sometimes will not work. Then other methods must be used in order to find out where one can transfer to. In Section 14, we have shown how the principle of the reversibility of fares can be used to facilitate direct collection. This is, generally speaking, about the best clue a collector can have, provided he can first secure one specimen transfer. Even that is not always necessary, since sometimes merely riding on a car and noting at what junctions transfer-paying passengers get on and at what junctions transfer-receiving passengers get off will serve as an indication of one or more places where transfers may be used. For example, we recently took a bus in Alhambra, Calif., on the Pacific Electric Railway system, and noted that a passenger got on at Garfield Avenue and paid fare by a transfer. On the return trip we decided to get the reverse transfer, and asked the conductor for a transfer to Garfield Avenue and got it. This transfer form had, as its issuing unit, all P. E. bus lines in Alhambra and South Pasadena, so it was unnecessary to look up any further clue for bus transfers in that region. In the case of overlap fare receipts, a car ride through the overlap region will show whether that plan is used, and a ride within the overlap itself will get the collector a sample. By not riding beyond the overlap, the collector gets off the car before the receipts are collected. 112. Separate Forms. The collector's object is to get specimens of as many different forms as may be available. For this particular purpose, there is no point in getting forms which are exactly alike in all essential respects. Of course, no two transfers of the same form will have the same serial number; or the time or date surcharge may differ; or the conductor's number or the run number may differ. But all these differences are those that occur commonly and generally between transfers of the same form, and there is no reason to include transfers in a collection which show no other differences. Such transfers are duplicates, and the collector should avoid them, and in any event, should not incorporate them into his main collection. However, it is sometimes interesting to keep on the side a special duplicate collection, in which the rule should also be to include only one of each form. Further duplicates may be kept separately as "extras." In Section 32 we have taken up the distinction between separate forms, and when transfers are or are not to be considered as of the same form. But this is somewhat arbitrary, and a good deal must be left to the collector's discretion in that matter. For instance, if a transfer collector is making a collection of New York forms, it is certainly a matter of discretion as to whether that collection should include both the A. M. and P. M. forms from each transfer issuing unit of the Third Avenue Railway System in Manhattan, the Bronx, and Westchester County, and similarly with the two-cent forms of the New York Railways Company. We would be inclined to consider the A. M. and P.M. transfers of the same issuing unit on these systems as the same form, because the only difference is one of time-punch spaces and surcharges denoting time; but it would hardly he unfair for the collector to include a transfer for of each half-day from each unit in his collection, and thus add 107 forms to the collection. A similar problem was presented by the A. M. and P.M. transfers on the Los Angeles Railway in their issue of 1921. The question similarly arises in the case of new issues where minor changes are involved. Again, slight alterations in coloring may be real changes of form or may be due to mechanical irregularities. In all such cases the collector should use his discretion as to how much is eligible for his collection of separate forms. 113. Tickets and Receipts. In Section 1 we explained what is to be included under the heading of a transfer, or, in other words, what is to be considered as a legitimate part of a collection or transfers. This does not, generally speaking, include plain railroad tickets and cash fare receipts, although the latter matter must be left to the collector's discretion where the receipts are based on single or double zone fares, and otherwise resemble ordinary transfers in general appearance. Receipts resembling in appearance the regular railroad fare receipts and rebate tickets do not belong, properly speaking, to a collection of transfers, although sometimes such receipts apply on more than one car, and therefore have a use analogous to real transfers properly so called. Generally speaking, the first requirement for a transfer that belongs legitimately in a transfer collection, is that there shall be a regular local fare zone at the junction or other form of transfer point. The exact type of vehicle makes little difference, as we have seen in Section 2. The best guess the collector can make, especially if he is in a strange city, is to try the street cars, providing there are several lines in the local fare zone not too closely paralleling each other and belonging to the same system; though there may be cases where this would not be likely to yield transfers. 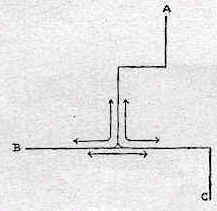 Thus, where there are three lines, running as in the diagram below, between A and B, between A and C, and between B and C respectively, and no other lines, there will probably be no transfers issued. Buses where operated under a single management instead of by various individuals, present as good a prospect to the transfer collector, as a general rule, as do street cars. But the so-called "interurban" trolley cars and buses are generally operated on the standard railroad arrangement of collecting and charging fare, so that only tickets and receipts may be expected from them. However, if systems can he found to operate local transportation service in any locality in their territory, real transfers may he looked for there; similarly if, as frequently happens, the interurban cars collect their fares on a zone basis, as is the usual thing in the Atlantic states. Therefore, when dealing with interurbans, even when known to use railroad tickets and give checks and receipts similar to the standard railroads, the transfer collector should, before giving it up as a prospect for his collection, examine whether the system operates local service anywhere along its lines, and whether it gives transfers to the local service in any such places. For instance, the Puget Sound Electric Railway, operating an interurban trolley line from Seattle to Tacoma, Wash., gives transfers to local street cars in Tacoma, even though they are operated by another system. The Lake Shore Electric Railway, operating an interurban trolley system between Cleveland and Toledo, Ohio, also operates local street car service at Sandusky and Lorain, and issues transfers in those cities. Its interurban cars also give transfers to local street cars in Cleveland, but those transfers are issued by the Cleveland Railway Company, over whose tracks the interurban runs, and do not differ from the forms issued by local cars in Cleveland running over the same tracks. But here again caution should be used. Sometimes an interurban will give a cash fare receipt in standard railroad form, and allow it to be used for an additional ride on local cars (or buses, as the case may be). The collector could hardly undertake to collect these without involving himself in a collection of long-distance tickets and cash fare receipts, and going completely astray from the field of transfers proper. 114. New Issues. In case of a new issue on any system, the collector of transfers is thereby afforded the opportunity of adding an entirely new set to his collection, and, to make the collection from that system complete, should get a sample of every form altered or introduced by the change. The change may be one of arrangement of the transfer itself, or it may consist simply in a minor change in the wording. The latter sort of alteration is very deceptive, since it may escape notice entirely unless the collector takes the trouble of reading carefully the inscriptions on all transfers in his collection―a thing which he should do anyway. A new issue may sometimes involve the introduction of only a very few forms on a system. Sometimes the new issue consists in a change in the color schedule; in such case it is not important whether this change be considered as a new issue or as one of the cases where coloring is temporarily altered. An alteration of the transfer privileges of a system as described on the transfers is usually an occasion for a new issue of transfers, whether it be a change in fare zones, or the adoption of new transfer privileges or the abolition of old ones, or the change of transfer points, or a re-routing of car lines. The latter is probably the most common cause for alteration in transfer forms. In any event, where such change in the system takes place, a new issue should be looked for in so far as the statements on existing transfer forms become incorrect. There have been frequent changes of this sort, for example, on the Brooklyn-Manhattan Transit System (formerly the Brooklyn Rapid Transit System). On our own count, issue [I] was at the end of 1921 and the beginning of 1922. On November 2, 1922, two car lines, the Marcy Avenue and the Park Avenue lines, were restored to service, but did not come within the range of the two-cent transfer privilege which is almost universal within the central surface fare zone on that system. Accordingly the two-cent transfer forms of all lines intersecting these, considering that the receiving conditions were denoted by endorsed exceptions, had to add these lines to the list of exceptions. This, though a minor alteration that would ordinarily have escaped notice, constituted a new issue of those forms; there were also several free transfer forms included in this "new issue," which we marked as issue [II] of which we collected 21 forms. Transfers on this system are marked with the initials of the issuing subsidiary company. One of these, the New York Consolidated Railroad, was reorganized in June, 1923, and renamed the New York Rapid Transit Corporation, and, in a few months, the few transfer forms issued by it appeared with the new name of the sub-system. This issue affected very few forms, but was marked as issue [III] in our collection. In December of the same year, issue [IV] appeared, when the system stopped running cars over the Williamsburg Bridge and suppressed matter on its transfers referring to cars crossing that bridge, though the Brooklyn City Railroad, which also made the same change, never put that change on its transfer forms, making its transfers to that extent vestigial. Issue [V] came in July, 1924, with the opening of the 14th Street Subway, when three car lines, the Marcy Avenue, the Broadway, and the Metropolitan Avenue, were re-routed. Between the issuance of [IV] and [ V ], the Montague Street line was discontinued, and was taken off the Dekalb Avenue "continuing trip ticket"; the new form of this transfer was therefore assigned by us to an intermediate place between those two issues, as [IV.1]. The New York and Queens County Railway affords a slightly different example of new issues. Here, counting the early part of 1922 as issue [I], the first change was a very sweeping one, when the system split in two due to a mortgage receivership of part of the lines. Beginning with the receivership on May 10, 1922, the most important part of the system became essentially part of the Third Avenue Railway System and had its own separate transfer forms; the original N. Y. & Q. C. issued a make-shift set of transfers on thin paper, and rubber stamped the dates where they had previously been surcharged. This was issue [II]. Issue [III] came in about a month, on better paper, and with somewhat altered colors; succeeded in a couple of months by issue [IV] in which the rubber stamp was replaced by a regular date surcharge. On May 15, 1923, the entire routing of the system was changed, but the same issue was continued for a short time as vestigial transfers, the conditions stated on them no longer having any relation to the actual conditions of use. This was soon remedied by issue [ V ], in which a complete change was made, the Smith-Pope type of the previous issues being replaced by a Moran type, and reduced the number of forms to two. A raise in fare during 1924, from 5 to 6 cents, however, had no effect on the transfer forms. Such a raise in fare on the Philadelphia Rapid Transit system, though (from 7 to 8 cents) did result in alteration of many transfer forms, because the change in fare was accompanied by an alteration in transfer privileges by extending the right of free transfer. To illustrate how to look for a new issue when such alterations of transferral arrangements have been made, we may take the instance of the Brooklyn (N. Y.) lines above mentioned, when the 14th Street Subway was opened in July, 1924. The alterations were, besides the subway itself: (I) The former Marcy Avenue and Broadway Ferry shuttle, dropping the last half of its name, was operated to the Lorimer Street Station of the new subway, instead of to the Broadway Ferry; (2) The Metropolitan Avenue Line was operated to the Williarnsburg Bridge; (3) The Broadway Line took over the Broadway Ferry service. This necessitated (a) including Metropolitan Avenue as an exception on the two-cent transfers of newly intersecting lines; (b) a transfer from Marcy Avenue to the Broadway Ferry service; (c) a change of name wherever the Marcy Avenue line was mentioned on transfers; (d) a new Broadway transfer form for the transfers from ferry cars. All this would be needed to bring the transfer inscriptions up to date, and, to a large extent, these changes were made. Since three lines of another system, the Brooklyn City Railroad, also gave transfer to the same Broadway Ferry line, the new issue also affected those three forms, as per (c) above. 115. Incomplete Transfers. The collector, whether proceeding by direct collection or otherwise, may frequently strike incomplete transfers, by which we mean transfers lacking some part or other which is subject to issuance to the passenger. Such a missing part, in the case of direct collection, is usually an attached coupon. The collector should, of course, use proper discretion as to incorporating such incomplete transfers into his collection; it will not do either to accept or reject them indiscriminately. It is a fair rule that incomplete transfers are to be accepted if they may be issued with no further parts than what they have. In any case, the collector who accepts incomplete transfers as part of his collection should be on the lookout to replace them as soon as possible by complete ones. Of course, we must consider that the Ham type (which we believe is now obsolete) is never issued complete; or that the Pope P.M. coupon is so common that, if a collector would adhere to the rule that only complete transfers are to be accepted, his collection would in most cases be restricted to the afternoon and evening. Even in the case of missing route coupons, a temporary acceptance into the collection is advisable, but with the notation that a coupon is missing. In the case of the Moran type, the only complete transfers are those which have a 12 o'clock time limit; the collector of Moran forms should accept all forms with time coupons missing, and replace them as opportunity offers by duplicates with more time coupons attached. Sometimes the incompleteness of a newly issued transfer is due to the conductor's carelessness in detaching it from the pad. Although such a transfer should be considered acceptable if too much is not missing, still this case is rather to be treated, from the collector's viewpoint, rather as a mutilated transfer than as an ordinary incomplete form.